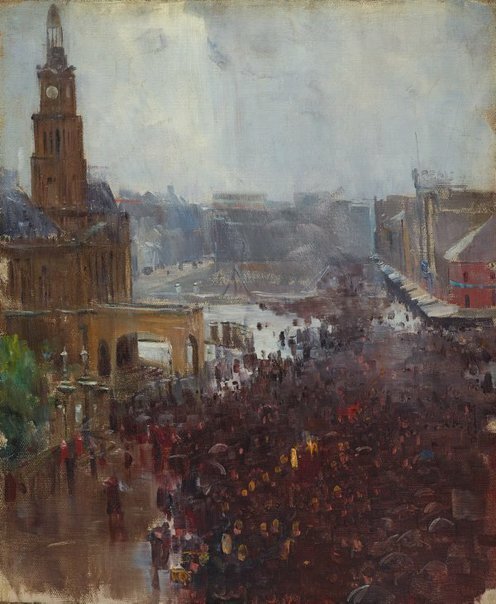 'Fireman's funeral, George Street' is a rainy city streetscene by Streeton that depicts the enormous public response to a fireman's heroic death, as the coffin passes the Sydney Town Hall and Queen Victoria Building construction site. International influences on Streeton's choice of subject matter and his evocative approach, include French and British Impressionism as well as the decorative, asymmetrical design and flattened picture plane of Japanese woodcuts. Streeton continued to experiment with these elements throughout the mid-1890s in his numerous paintings of Sydney Harbour and decorative panels on the subject of Sirius Cove completed whilst he was staying at nearby Curlew Camp. Alan Krell, Fireworks: tracing the incendiary in Australian art , 'In its element', pg. 42-71, Mackay, 2005, 46, 47 (colour illus. ), 50, 75. Art of Australia. Vol 1: Exploration to Federation , ‘Individual and national feeling’, pg. 545-610, Sydney, 2008, 576, 578 (colour illus. ).